We are moored in the very snug, very sheltered natural harbour of Gjoa Haven. Our days are spent comfortably: I light the stove in the morning, and put on the water for coffee. We get up, putter about the boat for an hour or so before heading to land. We visit our friends, play some music, enjoy the company of their young family, talk about our voyage, and talk about the ice. Always it comes back to the ice. You see, we are heading eastbound on this Northwest Passage. The westbound route is virtually ice-free. Should we wish, we could leave Gjoa Haven, spin the boat around towards the setting sun and end up in Nome, Alaska in three weeks or so. The east route, though, is where we want and need to go. Originally we planned on overwintering the boat in Iceland, but more and more the possibility of Greenland for the winter is becoming real. The ice, with its moving, shifting, s-l-o-w-l-y thawing mass, presents a huge roadblock for our passage east. 9/10ths or greater ice still covers most of our first 400 miles. This stops us from even considering leaving Gjoa. Once we depart here, we will have few places to shelter and fewer still where fuel, water, groceries, internet and the relative comforts of modern life are accessible. Once we leave Gjoa, we plan to not stop until we reach Greenland, a thousand miles away. Historically, September is the month with the most ice-free days for the Central Arctic. Our window is slim – Jesse and I deliberately set our date to return to North America (Canada for me, Alaska for him) on September 17. We knew that sailing the North Atlantic Ocean after mid-September was not a pleasant prosect, so with that in mind, way back in May, we booked our return trip for September 17. So, as of today, August 18, we have now 30 days left to get this boat out of the Arctic. Nuuk, Greenland, is our planned overwinter port. Always it comes back to the ice. Daily we pore over the ice charts published by Environment Canada. Is that lead opening up? Is the ice receding? Is there room for the pack ice to break up in the small stretches of open water that don’t seem to grow? Waiting, and waiting, watching the incremental changes in the ice pack, testing our patience but not our resolve. We discuss back up plans…freeze the boat in here in Gjoa? Return to Cambridge Bay and haul out again with the crane? Head west to Alaska? This last alternative is rapidly becoming moot as the days creep by – we would need fair winds and great progress to make it through the Aleutian chain before mid-September…and the Aleutians in the fall are not recommended any more than the North Atlantic. Today, the wind howled out of the northeast at gale force (30-35 knots) and kept us bound to our little floating home – too windy to risk leaving the boat unattended (anchor dragging is always possible in strong winds) and also too risky to row to shore in our tender. So today, we did not check the ice charts. We discuss the ice with our neighbour boat, Altan Girl, crewed solo by a man from Nanaimo. The talk is that these gale force northeast winds will help break up the ice pack, by hurling the ice in a different direction than the prevailing northwest winds. And so we wait. We chop wood, haul water, tell stories, visit with our new-found friends, watch movies, cozy up in front of the woodstove. Empiricus sits very still on the water, barely moving except in strong winds, so quiet that I almost forget we are in a boat, floating on the Arctic Ocean. She feels homey and secure, and I almost forget that we have 1500 miles of Arctic sailing to do before we get to ice-free waters. But at night, lying in comfort in this snug harbour, I dream of ice. Its impressive how far youve gotten in a small boat, I worked in that area years ago and its pretty harsh. I dont know how the Brits did it 100’s of years ago, in wooden ships, limited supplies and of course no proper maps, communication or satellite info. Yes, this is a tough climate for sure. I think those early explorers must have held their breath many a time as they sailed in uncharted, ice-filled waters with no certainty of retreat. 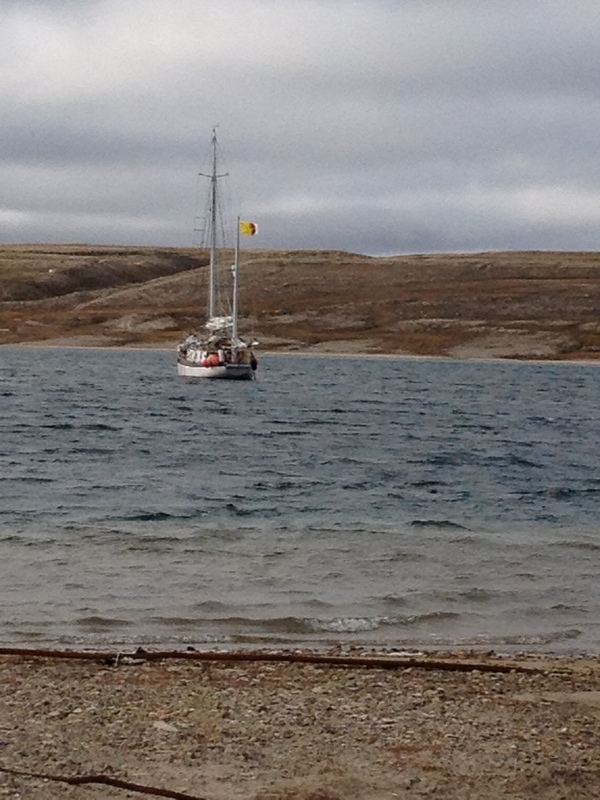 We are exploring Nunavut by water – a real privilege.